On this date, Dorothy Ripley became the first woman known to have spoken in the House Chamber when she delivered a sermon during a Sunday service at the Capitol. Ripley preached in the chamber at a time when it was used frequently by itinerant missionaries and clergy from local congregations. 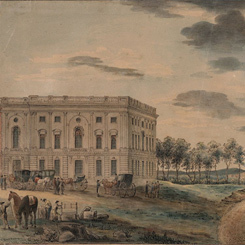 Until the mid-19th century, Washington, D.C., had few buildings large enough for public gatherings and the House Chamber was often utilized as a place of worship. In 1806, the House itself was hard-pressed for meeting space. Since the Capitol’s House (or South) wing was still under construction, the House was temporarily crammed into the Library of Congress’s reading room, located in the Senate (North) wing.